Lists. They’re so hot right now. Everyone’s doing it. This one: The Ten Commandments of Blog Comments I found super-useful (especially now with so many new readers and comments – HEY ALL WHAT UP? So in the spirit of international post-a-list day (i’m just kidding, stop panicking and trying to find the bullet points on your computer) here’s my list. 1) Having a baby means you can make a damn fool of yourself in public and it’s ok. Such as singing “Some Nights” at the top of your lungs in the Wal-Mart parking lot or making weird babble-y noises while walking through the mall. 2) Finally someone likes and applauds my singing. And asks for more. 3) I get to revisit all the awesome things I LOVED as a child and see them again through the eyes of my child. I showed him the Real Ghostbusters cartoon from the 80’s today and he crapped his pants. Though that might have been a coincidence. 4) I don’t need alcohol to laugh hysterically while rolling around on the floor anymore. Just a baby giving me raspberries on my tummy or wrestling-style slamming his tummy into mine. 5) I can avoid conversations with pushy salespeople at mall kiosks (Dead sea lotion guys I’m looking at you) by pretending my baby is stinky/hungry/dangerous. 6) There’s nothing like a mobile baby in the house to motivate dwellers to clean up after themselves. 7) People don’t think I’m talking to myself anymore. 8) Babies bring family and friends closer. Also the elderly. Whether you want them to or not. 9) My breasts finally have a purpose above annoying me/attracting attention. They are the perfect shelf for snacks baby hasn’t finished yet. 10) The fact that finally someone in this house is adorably and fashionably dressed. This post was sponsored by the wonderful day out with Arthur I had today where we traversed the wilds of Brampton, made new friends and avoided old enemies. When I was a little girl I was fascinated by the ocean. My favourite animal was (and still is) the humpback whale and I dreamed of the day I could see one in real life. I loved the sound of the ocean, waves crashing against the shore. I loved the look of the moon rippling on the water late at night. Colourful fishing boats floating just off of the shoreline. Thing is…I had never seen the ocean. Everything I knew about it I knew from pictures and National Geographic specials. It was the one place I wanted to go. The one natural thing in this world I desired to see with my own eyes. I especially wanted to visit the East coast of Canada – Nova Scotia, PEI, Newfoundland. I was fascinated by the beauty in the pictures I saw and I thought where better to see the ocean and possibly…whales? In my early 20’s two beautiful friends of mine took a trip to the East coast. I couldn’t go due to financial restraints but they brought me back a little something that, to this day, is one of my precious things. The risk is if we open this now it’ll probably kill us all. 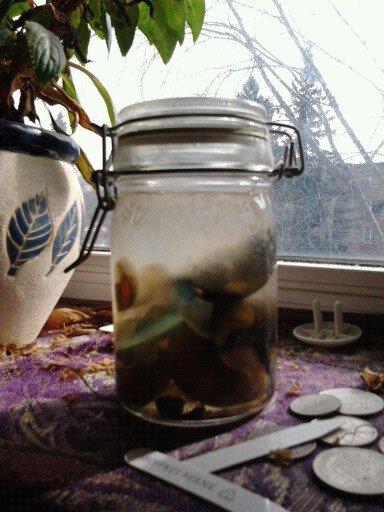 They’d gone to the ocean and packed a small jar full of findings and seawater. I opened it once or twice when I first got it just to smell the salty water. I think this is still one of the nicest gifts I’ve ever gotten. My first attempt at seeing the ocean was when I accompanied my boss on a trip to an anime convention in California. I told him how I’d never seen the ocean so we took a trip to the shore as the sun set and dusk fell. I could smell the sea and hear the waves but I didn’t get close to the water. There was a palm tree and I excitedly hopped over to see it. Which is when I was accosted by the buzzing of some sort of insect flying at me. It was probably some kind of beetle but seriously – the sound of it’s wings made me picture something the size of my head. I’m not good with bugs normally but when one is flying right at me and I’m in a skirt and I’m picturing the mutant june bug from hell – well let’s just say I didn’t stop moving till I was back in the car. My boss got a good laugh over it. It wasn’t until a few years later, after I’d met Fred and we took our first vacation together, that I got to get my feet wet. 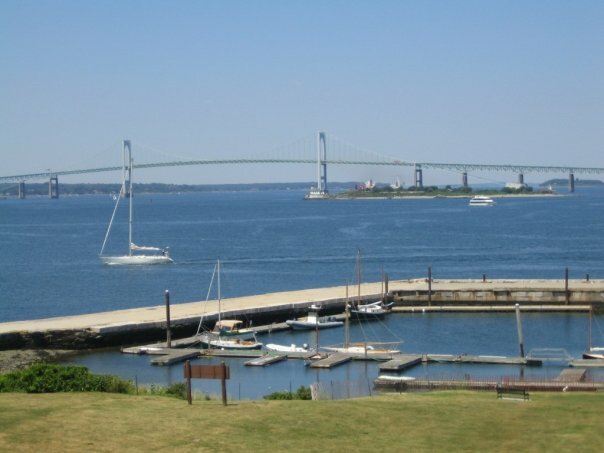 We traveled down to Rhode Island to visit my best friend and her husband. About an hour out from Rhode Island is…OCEAN! The waves were fun and quite big! It was windy and rainy that day so the waves were deliciously big. I remember squealing and giggling like a little kid as the water pushed me this way and that. I’m not a great swimmer so I didn’t go in too far but I still got wet from head to toe. I tasted the seawater and got sand and rocks between my toes. 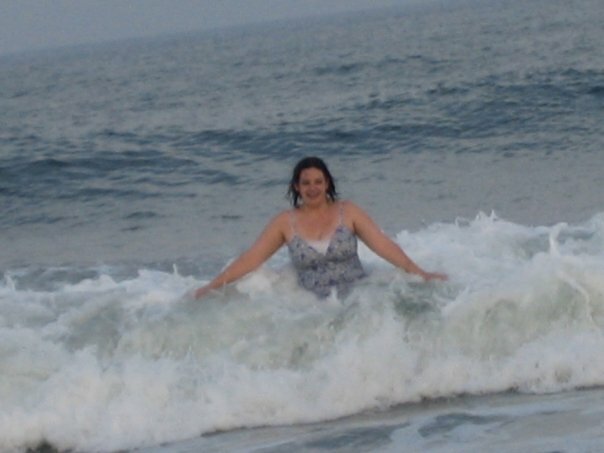 I reveled in the beautiful blue hues of the ocean ripples and danced in the frothy sea foam. It was so much fun and I was in love even more with the ocean. This bridge went OVER the ocean – it was nailbitingly HUGE. I still haven’t seen a whale in real life. Or the east coast. But now I have someone with whom to share my childlike wonder at the ocean and all of it’s contents. I’m looking forward to when Arthur (and any future siblings) are old enough for a trip out East. Because I believe it’s important for them to experience the country we live in from coast to coast – so they know why we must love and protect it. I want him to have the joy of splashing in the waves and fond memories of days at the beach. And I want to take him whale watching so he will understand how very, very important it is to protect the whales of the world. But most of all I want to share with him all the things that I find wondrous and exciting because sharing those things – that’s one of the best things about being a mom. And the ocean is the most wondrous and exciting thing of all. Come hug puppies and eat cupcakes with me! Follow Me As I Follow Geeky Celebs!